Greg started spearing in the 70’s and by the 80’s had won pretty much every competition there was in Australia. In the 90’s Greg started looking abroad and had some seriously impressive results on the international scene, including a win in South Africa in an international competition with France and Portugal. During this time, Greg’s travels started taking him to places where he could encounter blue water species. 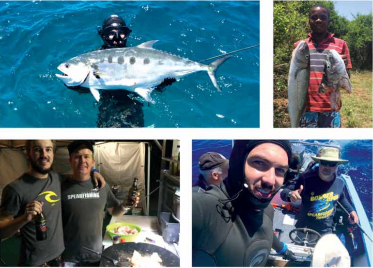 Blue water hunting was a relatively new concept and it was not long before Greg met Terry Mass who at the was time working on his legendary book ‘Blue Water Hunting’. Greg and Terry became good friends and Greg even contributed to Terry’s book. 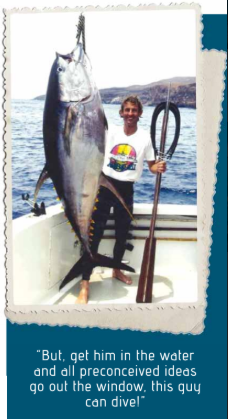 Their friendship lead to numerous trips to Mexico and Greg continued to add to his number of world records, eventually landing the first ever Tuna of over 300lbs. It was on these adventures that Greg also met legendary videographer Ron Mullins. Ron’s ground breaking film ‘Freediving the Revillagigedos’ featured Greg stoning a magnificent 200lbs Yellow Fin Tuna off San Benedict Island. 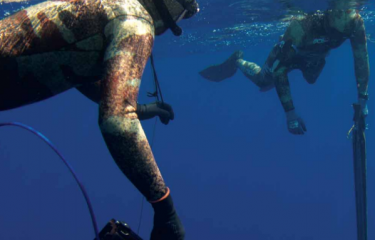 When I first saw Ron’s ‘Freediving the Revillagigedos’ I was still to get a fish over 20kg. It was also in a time when there was no internet or even spearfishing magazines available in South Africa. It was this one shot that instantly made Greg a spearfishing god in my eyes. What those guys were doing was simply inconceivable, and the film and his diving became the inspiration for spearfishermen all around the world. Blue water hunting would never be the same again. The impact of watching Greg diving in Ron’s film had a massive influence on my life. It was the inspiration that lead to films, this magazine and countless quests to far corners of the earth. It was not long after that, when Greg broke the Spanish Mackerel world record. This for us on the east coast of Africa could be equated to being a world champion. The Spanish Mackerel was and still is our primary big gamefish. To get one over 20kg in those shore diving days was a huge achievement. Greg’s 46.2kg world record fish was just incredible! Greg became the most revered spearfisherman in the whole world to me. I learnt later that he actually shot this amazing record (which still stands today) while recovering from a shark attack. I remember wondering what kind of guy got back into the water after being bitten by a shark. You can only imagine how this added to the enigma. Over the years, through films, magazines and later the internet, I keenly followed Greg’s diving and exploits. Then, in October 2013 word of Greg being attacked by a Great White filtered through the news feeds. By the time I heard about the attack, Greg had survived, but I had no idea how serious it was or how close a call it had been. Around the same time, I had started planning a trip for Chris Wood, who unbeknown to me, was actually Greg’s regular dive buddy. One thing lead to another and the next thing I heard, Greg was going to join Chris on the trip, even if he wasn’t able to dive. For me it was a mixture of pure excitement to meet one of my all time heroes, and extreme pressure to also get everything right for the trip at the same time. Little did I know that the trip was actually Greg’s motivation to get his recovery on track and to get him back into diving. The time eventually arrived and we were landing on Nosy Be Island off Madagascar. Over 2 weeks we explored and dived together, and I got to get to know the great man who I had idolised for so many years. It’s funny… he is actually very unassuming and old school, especially when it comes to gear. I guess he has found what works for him and has just stuck with it. If you didn’t know who he was, you would be forgiven for thinking that he was just another average Joe. But, get him in the water and all preconceived ideas go out the window. This guy can dive! Add to this that only a few months before, he was in a hospital bed with his face, head and back ripped to shreds by a shark is nothing short of astounding. Most people did not think that he would dive again, and there he was making me work seriously hard on every single dive. After a week of following someone around the ocean with a camera, you get a really good idea of their abilities, style of diving and preferences. All I can say is that when I am 55 years old, I want to be diving as well as he is. I can’t imagine what he would be like in the water when firing on all cylinders. It is no wonder that he annihilated the competition in his early years. I learnt a lot from Greg, more from watching him than anything else. He is quietly spoken and although he doesn’t ever withhold information, he always waits to be asked. He is very passionate about spearfishing and we spent hours talking about trips and interesting places he had been to. I have a very keen interest in gear so I bent his ear on all his experiences and thoughts on all sorts of gear from wooden guns and pranger heads, to fins and snorkels… especially since he uses the strangest snorkel I have ever seen. The story of Greg Pickering is an amazing inspiration. The man himself more so, and the adage of ‘quiet waters run deep’ is very apt. It has been almost 20 years since his diving first inspired me, and is probably a big part of why my life and diving is what it is today. Now after this trip I feel even more inspired, not only to improve my spearfishing, but to see my diving progress through the next 20 years. It is guys like Greg that encourage you to take life by the horns and make the most of every opportunity. I am grateful that I have had the opportunity to get to know Greg, and it is truly a privilege to now be able to call him a friend.